Image: Referee Jair Marrufo has been assigned in week 3, where he’ll be supported by fourth official debutant Jaime Herrera. Nima Saghafi will make his first appearance as a center referee in MLS after being assigned to Philadelphia Union versus New England Revolution this weekend. 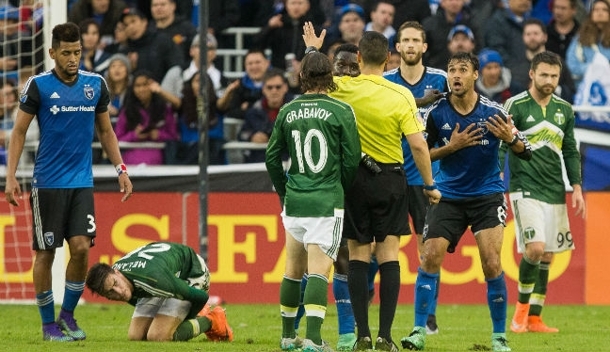 Saghafi had the honor of refereeing last year’s USL Championship Final, while he was assigned fourth official duties on 21 occasions in MLS last term. For his first game, he’ll be supported by an experienced crew of Sean Hurd, Adam Wienckowski and 2015 MLS Referee of the Year, Alan Kelly. There’s a debut assignment too for Jaime Herrera, who will be fourth official at New York Red Bulls versus Houston Dynamo. Herrera is new on the PRO roster this season, and he’ll support center referee Jair Marrufo at Red Bull Arena. Staying in New York, where Allen Chapman will get MLS Week 3 under way. Chapman has been assigned to New York City versus Orlando City on Friday for his second assignment of the season, and it’s his second in NY, after kicking things off with Red Bulls versus Toronto FC on Soccer Sunday. Appearing for the first time this season will be Robert Sibiga, who made his MLS bow last term with three center assignments. The Polish-born official has been assigned to Chicago Fire versus Columbus Crew, who Sibiga refereed on a memorable debut in June 2015. Hilario Grajeda made his long-awaited return to action last weekend following injury, and he’s back in Week 3, taking the whistle for Portland Timbers versus Real Salt Lake – the side who benefited from a good decision by Juan Guzman in their last fixture, a goal analyzed in PRO’s latest Play of the Week. The 2014 U.S. Open Cup Final referee Armando Villarreal, two-time Referee of the Year Mark Geiger, and 2015 All-Star referee Ismail Elfath all receive their second assignments of the campaign – they take charge at FC Dallas, Seattle Sounders, and LA Galaxy respectively. On Sunday, Chris Penso will be the referee when D.C. United play host to Colorado Rapids, before U.S. Open Cup champions Sporting Kansas City take on Toronto FC to bring the weekend to a close. Baldomero Toledo officiates that one, with Eduardo Mariscal and Jason White running the line, and Fotis Bazakos the fourth official.